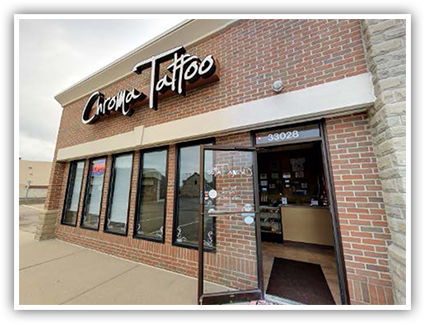 Chroma Tattoo in West Bloomfield thanks our incredible clients for trusting us for over 8 years. We appreciate your tattoo referrals to your friends and family. Thank you! Our work speaks for itself, but the reviews written online have made us proud. We are here to put beautiful tattoo art on people, and in the process, change their lives forever. This means a lot to us, which is why our artists put their all into every tattoo. We Take Pride in Our Custom Tattoo Art! First and foremost, we are in the tattoo business for the art. The tattoo piece we are working on at the time might not be something we would wear personally, but it's going to be done as if it were going to be on us forever. After all, every client who leaves our studio is connected to us for life, and we never forget that. It is important to know that ALL work coming out of Chroma Tattoo is custom drawn by our artists. A great tattoo is an entire creative process. A consultation is mandatory just so we can work out the details. We then set up an appointment for a day that works best for you. Our artists will sit down with you and discuss the design of the tattoo, we'll cover all of the possibilities to be sure we're giving you a great piece of art. Even if you are looking for a small tattoo, we still want to pick your brain and give you the most unique tattooing experience. 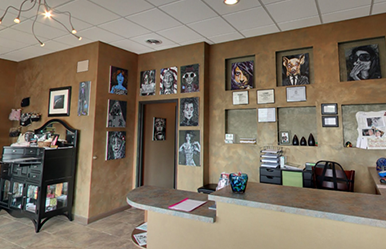 At Chroma Tattoo, you won't be able to just come in and choose a picture off the wall. Our walls are covered with artwork done by local Michigan artists and photographers. This leaves no room for generic tattoo designs! We are all unique, and we want unique tattoos! Come in and chat with one of our tattoo artists and put their minds to the test. We love challenges, and you'll get an incredible, unique piece of art you can proudly wear for life!